The sacrum is a part of the spine that lies between the fifth segment of the lumbar spine (L5) and the coccyx. Sacrum consists of five fused vertebrae S1-S5 and is triangular in shape. It is part of the pelvic girdle and forms the posterior wall of the pelvis and articulate with iliac bones at the sacroiliac joints. The sacral vertebrae develop by the end of the first month of embryonic development. The five vertebrae that constitute sacrum vertebrae are separate first and start to fuse during late adolescence and early adulthood. The single bone is formed around the age of thirty by completion of fusion. In some cases the sacrum will consist of six vertebrae when one lumbar vertebra participates as part of sacrum, a process called as sacralization of the lumbar vertebra; or be reduced in number to four when one sacral vertebra becomes part of the lumbar spine, a process called lumbarization of sacral vertebra. The sacrum is formed by the fusion of five sacral vertebrae has three surfaces, a base, and an apex. The body of the first segment is large and is similar to the lumbar vertebra whereas the bodies of the next bones get progressively smaller, are flattened from the back, and curved to shape. The sacrum articulates with four other bones – iliac bones on either side, L5 above and coccyx below. It is tilted forward and curved with anterior concavity and posterior convexity allowing greater room for the pelvic cavity. The curvature of sacrum varies in individuals. The base of the sacrum is broad and expanded and is directed upward and forward. Sacral promontory is the broadened part of sacrum that marks part of the border of the pelvic inlet. The sacral promontory articulates at an angle which is around 30 degrees [sacrovertebral angle]. The apex is directed downward and presents an oval facet for articulation with the coccyx. The sacral canal is a continuation of the vertebral canal and runs through the center of sacrum for most of its part. The pelvic surface is concave vertically as well as horizontally. In its middle part, it is crossed by four transverse ridges, which correspond to the sites of fusion of vertebrae. On either side, at each end of the transverse ridges, four anterior sacral foramina are present. The size of foramina decreases from above downwards with diminishing size of vertebral bodies. These foramina provide an exit to the anterior divisions of the sacral nerves and serve as the entrance to the lateral sacral arteries. Four broad, shallow grooves are present which are separated by prominent ridges lateral to foramina. The anterior divisions of the sacral nerves pass through the grooves and ridges give origins to the piriformis muscle. The dorsal surface of the sacrum is convex and narrower than the pelvic surface. The midline is marked by a crest called median sacral crest which is topped by three or four tubercles representing the fused spinous process. On either side of sacral crest is a shallow sacral groove whose floor is formed by united laminae of corresponding vertebrae. Multifidus muscle takes origin from this groove. Laminae of the fifth sacral vertebra [sometimes fourth also] do not meet at the back and leave an opening in the posterior wall of the sacral canal. 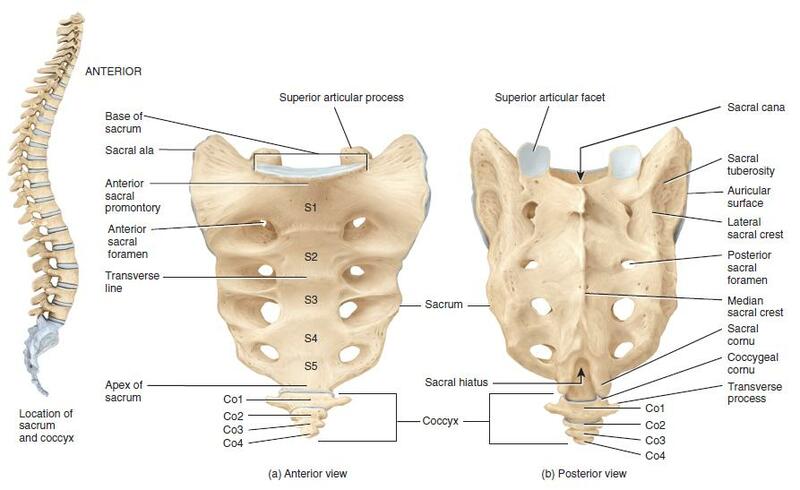 The articular process of first sacral vertebra articulate with that of the lumbar vertebra. The fusion of the rest of articular processes on the lateral aspect of the sacral groove forms series of tubercles also known as lateral sacral articular crests. Size of tubercles decreases from above downwards. The tubercles of the fifth sacral vertebra are known as the sacral cornu, are projected downward, and are connected to the cornua of the coccyx. Posterior sacral foramina, four in number, smaller in size and less regular than anterior foramina are present on side of tubercles. These transmit the posterior divisions of the sacral nerves. A series of tubercles on lateral side of foramina represent the transverse processes of the sacral vertebrae, and together these form the lateral crest of the sacrum on First two tubercles give attachment to the horizontal parts of the posterior sacroiliac ligaments and those of the third vertebra give attachment to the oblique part of the posterior sacroiliac ligaments. Fourth and fifth give attachment to the sacrotuberous ligaments. The lateral surface of the sacrum is broad above but narrows into a thin edge below. The first three vertebrae of the sacrum have transverse processes that together form wide lateral wings called alae which have the auricular surface [because it resembles an ear] bearing articular cartilage to articulate with the ilium. The sacral tuberosity is behind the articular surface and consists of are three deep and uneven impressions, for the attachment of the posterior sacroiliac ligament. The lower half is thin and ends in a projection called the inferior lateral angle. Medial to this angle is a notch, which is converted into a foramen by the transverse process of the first piece of the coccyx. This notch transmits the anterior division of the fifth sacral nerve. The thin lower half of the lateral surface gives attachment to the sacrotuberous and sacrospinous ligaments, to some fibers of the gluteus maximus at the back and to the coccygeus in the front. The sacrum is differently shaped in males and females. Female sacrum is shorter and wider than male sacrum, more curved and placed more obliquely backward. This increases the size of the pelvic cavity and makes the sacrovertebral angle more prominent. Several key muscles of the hip joint, including the gluteus maximus, iliacus, and piriformis, have their origins on the surface of the sacrum and pull on the sacrum to move the leg. The sacrum also surrounds and protects the spinal nerves of the lower back as they wind their way inferiorly toward the end of the trunk and into the legs. Finally, the sacrum helps to form the pelvic cavity that supports and protects the delicate organs of the abdominopelvic cavity and provides space for a fetus to pass through during childbirth. Spina bifida occurs as a result of a defective embryonic neural tube, characterized by the incomplete closure of vertebral arch or of the incomplete closure of the surface of the vertebral canal and is e most common the lumbar and sacral areas. Sacral agenesis is characterized by an abnormal of the lower spine which may result in the complete or incomplete absence of sacrum and lower spine. The sacrum is one of the main sites for the development of malignancies like chordomas and sarcoma.